The list of superfoods continues to grow as researchers explore the amazing nutritional profiles of foods that were once overlooked. Many of these foods have been used for centuries by indigenous people practicing traditional medicine, but modern science is placing them under the microscope to determine the mechanisms behind their health benefits. Tiger nuts are the next big superfood, packing a powerful nutritional punch in a small package. Tiger nuts come from a plant known by its scientific name, Cyperus esculentus (Bamishaiye & Bamishaiye, 2011). Also known as nut grass or yellow nutsedge, this plant originated in Southern Europe but became naturalized in Ghana, Nigeria, and Sierra Leone. Archaeological evidence suggests that this nut has been cultivated for thousands of years, providing a critical component of the embalming process for Egyptian pharaohs (Bamishaiye & Bamishaiye, 2011). 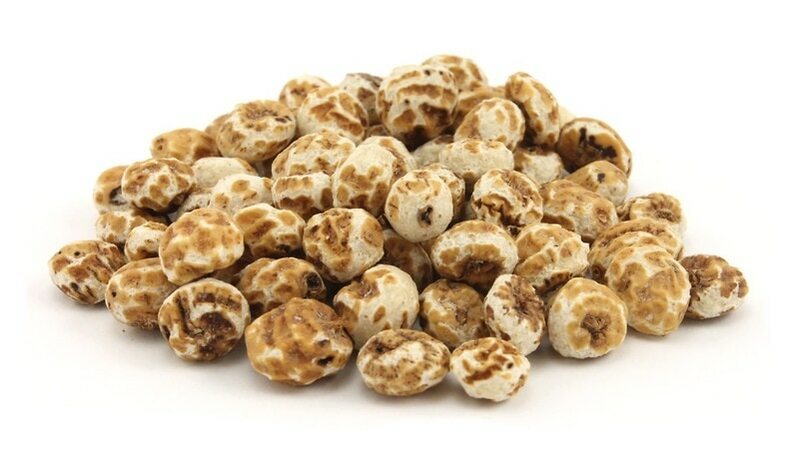 Today, tiger nuts are widely produced in Africa and have incredible nutritional benefits. They can be eaten fresh, semi-dried, or fully dried. Additionally, tiger nut milk and tiger nut oil are often sold as forms of the nuts. Although tiger nuts were briefly popular in the 1950s and 1960s, they have only recently been rediscovered for their health properties. Now, they are poised to become the next big superfood. High energy content. Like all nuts, tiger nuts have an intensely concentrated energy content. Per unit volume, they contain an extraordinarily high amount of healthy fats and protein to support your body. As a protein-rich food, tiger nuts are a great way to stave off hunger pangs and stabilize blood sugar. Phosphorus. Phosphorus is found in every cell in the body, forming part of the phospholipid cell membrane (Calvo, 2014). Without phosphorus, your cells would be unable to communicate with one another or to perform critical enzymatic reactions. Magnesium. Each 100 gram serving of tiger nuts gives your body 13 to 17% of its recommended daily dose of magnesium (Saduwa, 2015). Your body needs this micronutrient to produce energy, replicate DNA, produce new proteins, and signal between cells. Importantly, failure to get enough dietary magnesium is associated with higher risk of osteoporosis, hypertension, cardiovascular disease, and type 2 diabetes (Volpe, 2014). Healthy fats. Not all fats are bad for you. Healthy monounsaturated and polyunsaturated fats can support your cardiovascular functioning. The lipid profile of tiger nuts is similar to that of olive oil, delivering the healthy fats needed to reduce your risk of high cholesterol or cardiovascular disease. Iron. Iron is an essential component of hemoglobin, the compound that helps to deliver oxygen to your cells. Tiger nuts are an excellent source of iron, which is important because many people have a mild iron deficiency (Office of Dietary Supplements, 2015). Vitamin E. Vitamin E acts as an antioxidant, meaning that it fights against oxidative damage within your cells. Over time, accumulated oxidative damage may contribute to elevated risk of cancer, neurodegenerative conditions, and other chronic diseases (Office of Dietary Supplements, 2015). Thus, getting enough vitamin E may help your body stay healthy and avoid these conditions. Vitamin C. Vitamin C is an important component of protein metabolism and is beneficial for wound healing (Office of Dietary Supplements, 2015). Like vitamin E, vitamin C acts as an antioxidant to sweep up radical oxygen species that can damage cells. The vitamin C in tiger nuts can help you absorb the non-heme iron prevalent in tiger nuts. Tiger nuts can be particularly beneficial for vegetarians and vegans, given their protein and iron content. Getting iron-rich foods without eating animal products can be difficult, and tiger nuts provide a one-two punch with plenty of protein as well as a high amount of dietary iron, including the vitamin C your body needs to absorb the iron efficiently. Traditionally, tiger nuts have been consumed as a milk product (sometimes called horchata) or in their dried form. Tiger nuts make a great snack, providing a sweet taste without causing blood sugar spikes that can be particularly harmful for people with diabetes. Additionally, it is possible to rehydrate dried tiger nuts in water for a few hours. This makes them soft and gives them an entirely different texture to enjoy. Tiger nuts have a unique taste. They are sweet, with a flavor resembling that of chestnuts. In terms of texture, however, they are more similar to hazelnuts. One of the best ways to enjoy these nuts is by adding a handful to your favorite smoothie recipe, adding some natural sweetness and a protein boost. You can find a full listing of our tiger nut products (which includes flour, whole nuts, and tiger nut granola) here! Bamishaiye, E. & Bamishaiye, O.M. (2011). Tiger nuts: as a plant, its derivatives, and benefits. African Journal of Food, Agriculture, Nutrition and Development, 11(5), 1684-1701.